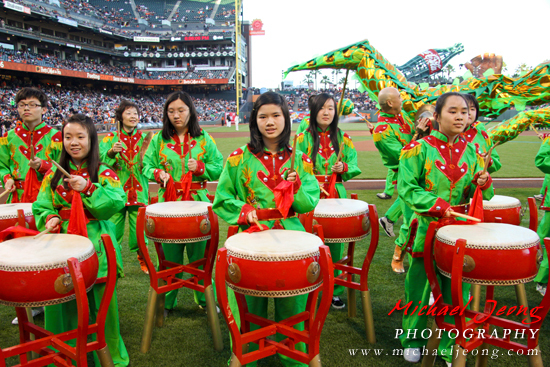 CYC members perform on the field for Chinese Heritage Night 2013. 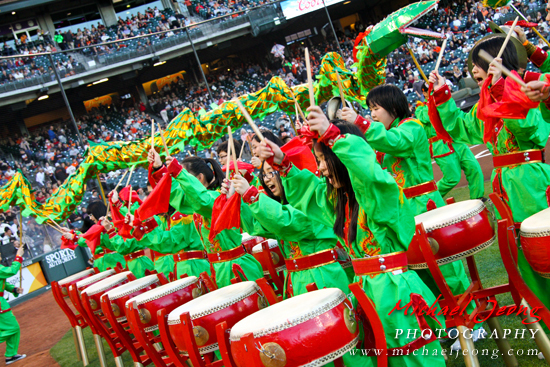 The San Francisco Giants played host Tuesday at AT&T Park for Chinese Heritage Night. Pre-game ceremonies started out wonderfully as the beautiful warm weather filled the park. 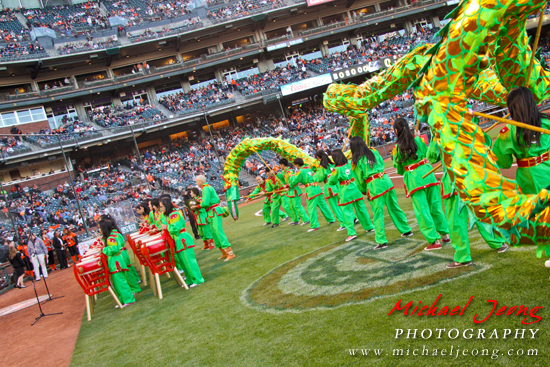 On the field, the Community Youth Center (CYC) performed a drum routine with 20 percussionists while 15 youth were carrying a green orb followed by a 40ft long green snake in celebration of the “Year of the Snake”, this year’s Chinese New Year Zodiac year. 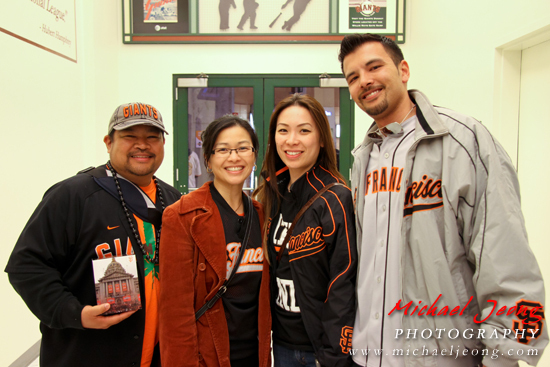 During the game, on the View Reserve level honoring Chinese Heritage Night guests who had purchased special tickets were allowed to receive a Collector’s Edition Giants themed “Year of the Snake” figurine. Partial ticket proceeds benefited local Chinese based charities. 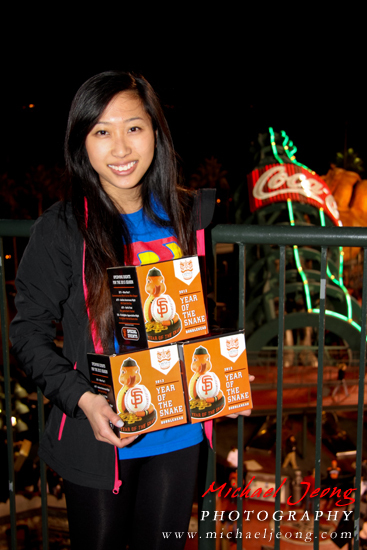 In addition to the special give away for Chinese Heritage Night, in community partnership with the SF Giants were representatives of the SF Hep B Free campaign, whose purpose is to bring awareness to the community of the Hepatitis B Virus (HBV) and encourage those to get tested and vaccinated. In support of the SF Hep B Free, local pageant title holders greeted and took pictures with fans. Some of the fans of these lovely ladies ranged from little youngsters to the elderly. It was fascinating to see the many smiles that these ladies brought to the ballpark. 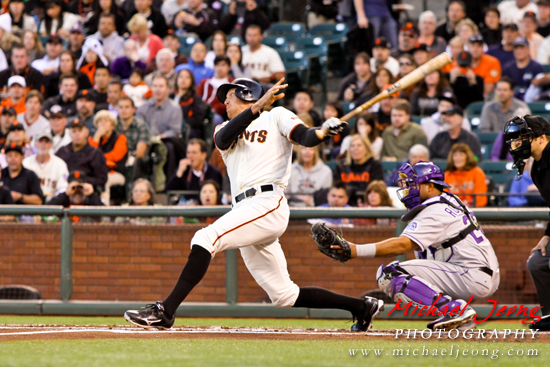 Meanwhile, with all the hoopla of Chinese Heritage Night, the San Francisco Giants trailed the Colorado Rockies 6-2. The Giants scored two runs in the first two innings, while the Rockies were rocking Tim Lincecum by scoring five runs in the 2nd inning and then another in the 5th inning. 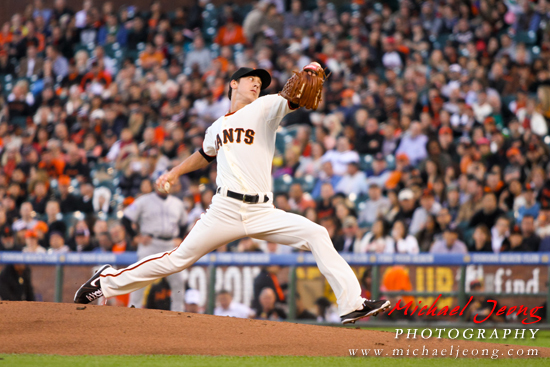 Bruce Bochy allowed Lincecum to pitch only 6 innings, giving Tim 7 strikeouts for the night. He allowed 6 total runs on 4 hits. 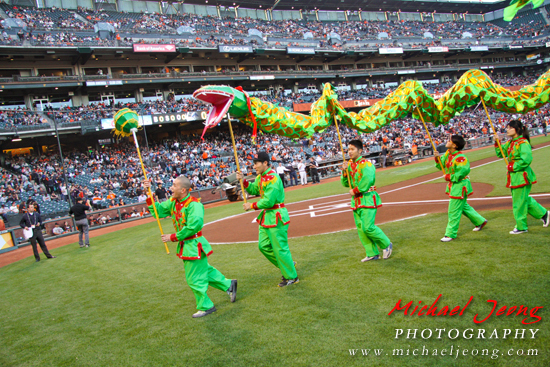 However, the Chinese Zodiac Snake was going to bite back and benefit the SF Giants by bringing great luck and fortune as they would eventually turn things around. The crowd came to life in the bottom of the 6th inning when the Giants picked up a base runner after Gregor Blanco was walked by Adam Ottavino. Immediately following, Hector Sanchez was walked also, moving Blanco to second base. On a wild pitch with Brandon Crawford batting, both runners then advanced to scoring position, but that wouldn’t matter because Crawford hit a three run homer to left field. A fourth run would come in as Hunter Pence singled to right allowing Nick Noonan to score. The Giants tied the Rockies 6-6 after the side was retired. Two innings passed with no Rockies scoring. In the bottom of the 8th inning, Andres Torres doubles to right field. Angel Pagan next up at bat hits a single line drive to center field as Torres comes in to score. 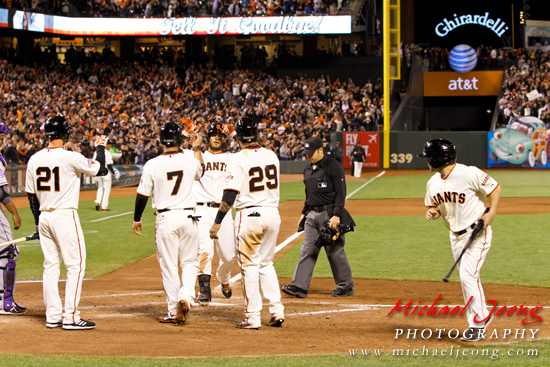 Marco Scutaro singles to left moving Pagan to 3rd. Next Pablo Sandoval singles scoring Pagan and moving Scutaro to 2nd. Hunter Pence lines out. Brandon Belt grounds into a force out to Sandoval at 2nd with Belt and Scutaro on the corners. Gregor Blanco with two outs on the board takes the chance with a bunt to first base, as it was going to roll foul, pitcher Wilton Lopez decides to play the ball and tries to throw out Blanco at 1st for the third out, but with no luck. Scutaro ends up scoring, while Belt moves to 2nd. Hector Sanchez strikes out swinging and the Giants take the lead 9-6. 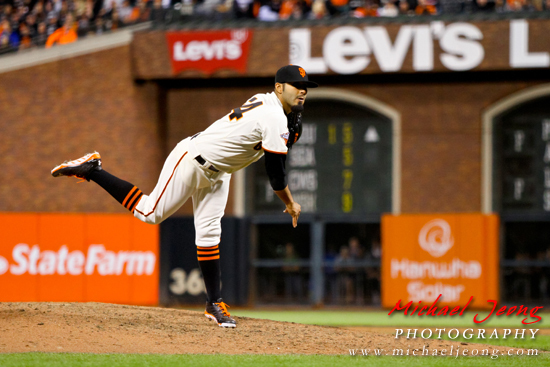 In the top of the 9th inning, Sergio Romo with 4 saves this season entered the game for a save opportunity. Reid Brignac faced Romo first, but hits into a ground out as Romo puts him out at first base to Belt. Next two batters, Eric Young and Dexter Fowler strike out swinging. Romo picks up his 5th save of the season and leads MLB in saves so far. Final score: Giants 9 – Rockies 6. The Giants picked up their largest deficit (4-runs) come-from-behind victory since Sept 11th, 2012 vs. Colorado. The Giants win also marked the eighth-straight victory over the Rockies, which is the longest current winning streak for any major league team against a current division rival. Lincecum luckily gets by with a no-decision as Reliever Santiago Casilla picks up his 1st win of the season. Rockies Matt Belisle picks up his 1st loss of the season. The SF Giants win on Chinese Heritage Night leaves the Giants in a 3-way tie for 1st in the NL West with a record of 5-3. They are tied with the Colorado Rockies and the Arizona Diamondbacks. Although the season is just beginning, it looks very promising for the SF Giants to get back into the playoffs and then hopefully onto the World Series for a repeat. 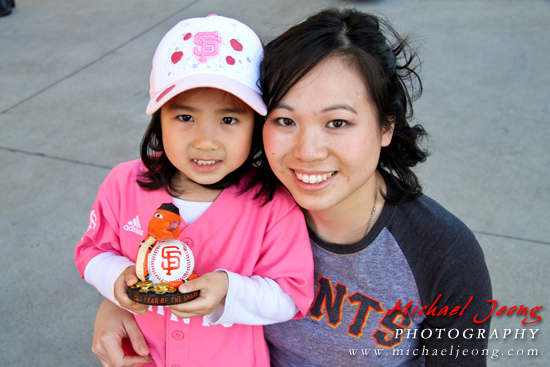 Mother and daughter at the game with their “Year of the Snake” bobblehead. Community Youth Center (CYC) youth perform on the drums. The CYC youth drum in unison. The CYC youth carry a 40ft. long snake while chasing a green orb. 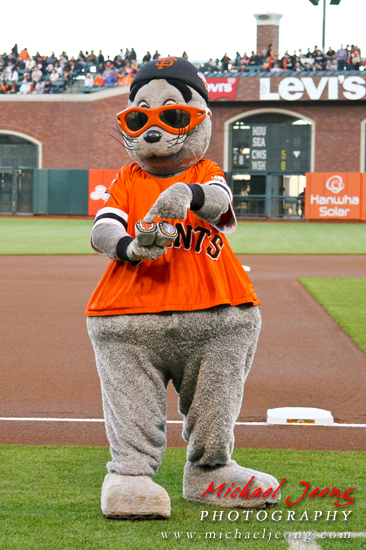 Lou Seal shows off his two World Series rings. The Collector’s Edition Giants themed “Year of the Snake” figurines. The first 20,000 fans at the game received a promotional 2012 World Series snow globe. 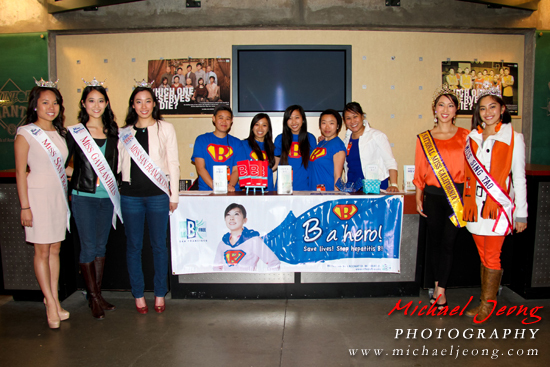 The SF Hep B Free table with brand ambassadors and local pageant title holders. 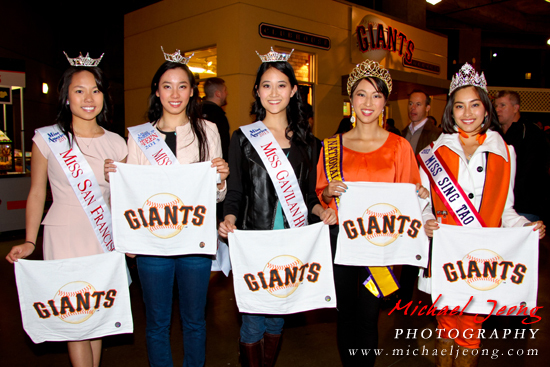 Local pageant title holders pose with SF Giants towels. Tim Lincecum on the mound allows for 4 hits and 6 runs. Lincecum strikes out 7 for the night. 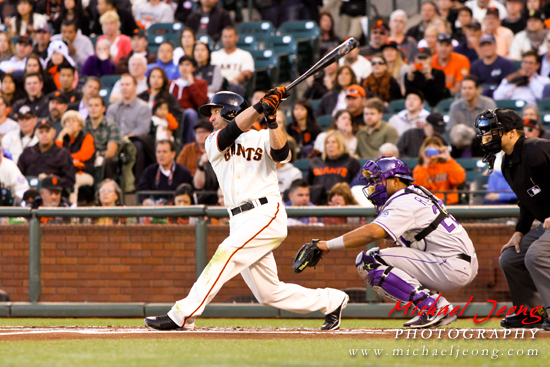 Marco Scutaro’s hitting groove is coming back as he hits 3 for 4. Hunter Pence with his seventh game hitting streak. Brandon Crawford is welcomed home after hitting a three run homer, which marks his second career home run at AT&T Park (coming on his 363rd plate appearance at AT&T). 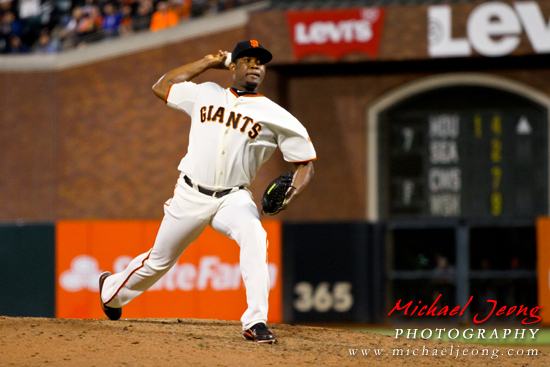 Santiago Casilla picks up his 1st win of the season. Sergio Romo picks up his 5th save of the season.